Pennsylvania Gov. 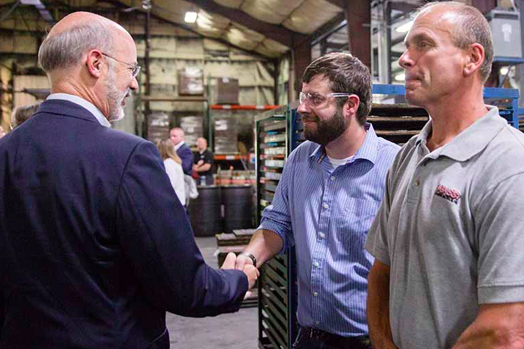 Tom Wolf meets with laborers. Pennsylvania employers, educators and economic development organizations soon will have access to an expanded pool of grant money for pre-apprenticeship and apprenticeship programs across the state, Gov. Tom Wolf announced Wednesday morning. Established through the Department of Community and Economic Development, the new program will encourage employers to proactively close existing skills gaps by providing specialized training for students and adults. Prospective apprenticeship sponsors will submit proposals to DECD and register programs with the Department of Labor & Industry's Apprenticeship and Training Office, created in early 2016 to stimulate job growth and workforce development. The Wolf administration said the new grant money comes from funds "clawed back" from businesses and organizations that received state support and failed to meet contractual requirements — job numbers, capital investment figures and other program guidelines. Those eligible to apply for the grants include single employers, employer consortiums, workforce development boards, economic development organizations, labor organization, career tech schools, Pennsylvania community colleges, and community organizations. DCED estimates that for every dollar spent on apprenticeships, employers get an average of $1.47 back in increased productivity. Last year, Philadelphia Works, a program located in southeastern Pennsylvania, received $214,686 to create manufacturing pre-apprenticeship programs, part of a $4 million strategic innovation grant program throughout the state. Since the establishment of ATO, Pennsylvania has brought on 2,610 new apprentices and 81 new registered apprenticeship occupations, raising the state total to 750 registered programs and more than 15,000 apprentices. Information about grant applications can be found at the DCED website. Registration for apprenticeship programs can be completed with the ATO at the website of the Department of Industry & Labor.